Buzz-In System: Worth the Hassle? At the beginning of the year we were all told about the new security system installed over the summer. There were two big changes: the new security cameras and the new buzz-in system for the front door. Students have expressed concerns about how they will be able to get in and out of the building during the day. Senior Amber Rich said, “During lunch times there are going to be a lot of people going in and out of the school and it’s going to be hard for everyone to come back inside.” The administration hopes that when people go outside for lunch they will all come back in together to avoid some of the hassle. Many students have also had concerns because they don’t know how the system works, and they haven’t been told how to use it. In the picture to the right you can see that it looks confusing. The black box on top has a camera, with a clear button you push to get in the building. 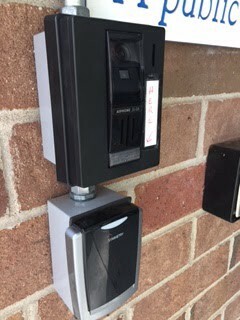 The second black box on the bottom is where you swipe your card, if you have one, to get in the building.